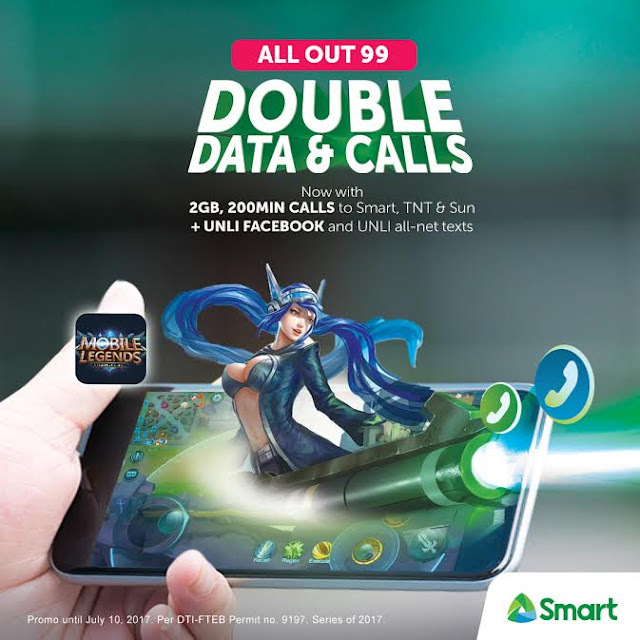 Double the Data, Double the Fun with this Exclusive Offer from SMART, SUN & TNT! Planning to go on a movie marathon this weekend? Or maybe play Mobile Legends to sawa? Well, keep the popcorn poppin' and brace yourselves you video-streaming fanatics and social media peeps. Smart Prepaid together with TNT and Sun Prepaid has rolled out their best offer (yet! ): an offer which DOUBLES THE INCLUSIONS and adds FREE Unlimited Facebook & FB Messenger on selected Smart prepaid offers. Enjoy DOUBLE the DATA with #SmartGigaSurf 99! Get 3GB of data for any site, 600MB for Youtube and more, plus UNLI Facebook, Only P99 for 7 days. Text GIGA99 to 9999 now! This promo is exclusive for this month and will run till July 10 only. So what are you waiting for? Below is a menu of the promo highlights. Load na friend! Unli FB includes full FB features (photos, etc.). You can highlight the Unli FB & Messenger in your post. Unli FB includes full FB features (photos, etc.). You can highlight the Unli FB.